Single-cell imaging developed which can record DNA methylation in real time. DNA methylation is essential for the proper control of gene expression and cell identity, what enables cells with the same genetic material to become, for example, a nerve cell, a muscle cell or a skin cell. Certain diseases, including cancer, involves changes in DNA methylation patterns, and the ability to document these alterations aid in the development of novel therapies. However, scientists have only been able to image of a few cells under methylation destroying the cells under study in the process and not taking into account the ‘methyl progression’ and change to the cell over time. Now, Whitehead Institute researchers have developed a methodology to monitor changes in DNA methylation in real-time in single cells. The team state that their tool will allow the global medical community to look in a very detailed way at issues like imprinting during development and screening for the activation of genes silenced in diseases like cancer, highlighting which drug will activate a given gene. The opensource study is published in the journal Cell. Previous studies show that an individual’s cells rely on the same set of genes as instructions for protein production. The differences between a muscle cell and a brain cell are attributable to differences in gene expression; that is, which genes are turned on and off. DNA methylation, the addition of methyl groups to the DNA, is an epigenetic mechanism that controls gene expression. In most cases, methylated genes are switched off, while unmethylated genes are active. To date, scientists have only been able to study methylation in a population of cells by taking a ‘snapshot’ of a few cells, a process that destroys the very cells under study. As most cell populations in vivo are heterogeneous, and methylation can change over time, existing approaches have offered limited insight into this fundamental biological control. In the current study the team synthesized a DNA methylation reporter that mirrors whether a nearby region is methylated. Results show that when the target region is unmethylated, the reporter is also unmethylated, which allows expression of a glowing protein encoded by the reporter. The lab observed that this protein illuminates the cell, with findings showing that when the target is methylated, so too is the reporter, and the glowing protein remains unexpressed, leaving the cell unlit. Data findings basically show that as the target region’s methylation changes, so does the reporter’s. The group conclude that now there is a reporter for methylation, researchers can screen for small molecules or genes that can change a cell’s phenotype. The researchers hypothesize that using the reporter a drug may also be indentified that could change the hypermethylation that has been associated with a specific cancer. The team surmise that using their new method, scientists should learn much more about methylation itself. For the future the lab states that this opens up a whole new field of research and can be used to answer all of these questions about methylation that are completely unknown, including how methylation regulates gene transcription and expression patterns in cells. Mammalian DNA methylation plays an essential role in development. To date, only snapshots of different mouse and human cell types have been generated, providing a static view on DNA methylation. To enable monitoring of methylation status as it changes over time, we establish a reporter of genomic methylation (RGM) that relies on a minimal imprinted gene promoter driving a fluorescent protein. We show that insertion of RGM proximal to promoter-associated CpG islands reports the gain or loss of DNA methylation. We further utilized RGM to report endogenous methylation dynamics of non-coding regulatory elements, such as the pluripotency-specific super enhancers of Sox2 and miR290. Loci-specific DNA methylation changes and their correlation with transcription were visualized during cell-state transition following differentiation of mouse embryonic stem cells and during reprogramming of somatic cells to pluripotency. RGM will allow the investigation of dynamic methylation changes during development and disease at single-cell resolution. 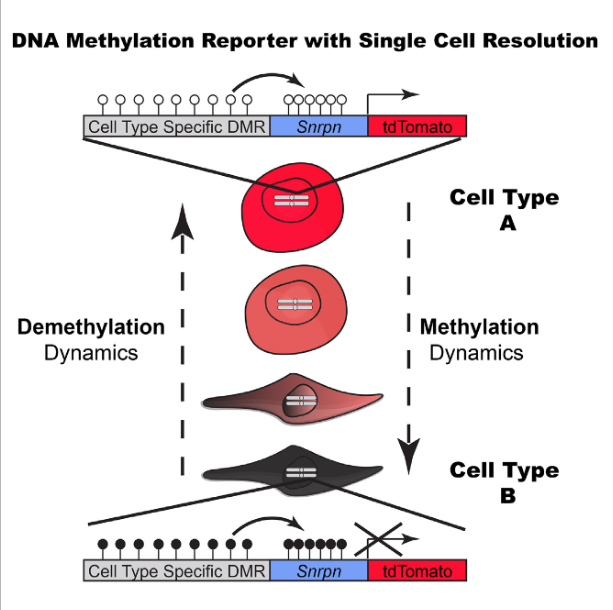 Tracing Dynamic Changes of DNA Methylation at Single-Cell Resolution. Rudolf Jaenisch et al 2015.